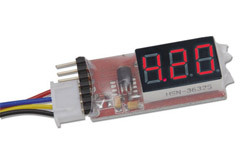 Quick to use and small to store, this simple LED display unit can measure the individual and single cell voltage of any Lithium technology pack up to 6S. The unit cycles across the individual voltages and then the total voltage in turn. The small size and low weight means that you can mount it in the model or use as a hand held unit. The unit pins are spaced at 2.5mm for XH plugs and an adaptor lead is included for 2.0mm spaced pins like EH and TP.